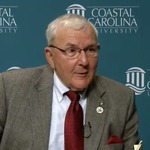 Squatriglia expands on his discussions in his earlier interview (Feb 9, 2016) , providing more details and statistics on the achievements of Student Affairs and the campus overall during his time at Coastal. Squatriglia, Robert W. and Tomczyk, Charmaine B., "Robert W. Squatriglia, oral history interview, Part Two" (2016). The Coastal Carolina University Oral History Project. 9.